RV 101® Education with Mark Polk: Why Filter your RV Drinking Water? Why Filter your RV Drinking Water? Over the years I have written numerous articles about water filtration, water quality and sanitizing your RV water system. There are lots of reasons to be concerned about the water we drink, especially when it comes to RV’s. When you travel in your RV and stop at different destinations on a regular basis you don’t know anything about the quality of the water you are using or drinking. It seems like every day you hear more and more about what is in the water we drink and how it can impact our health. I have always been an advocate for filtering the water in our RV and I am always on the lookout for the best possible method for filtering water. Back in October we attended the RVDA convention/Expo in Las Vegas. Every year vendors bring their wares to the convention and introduce these new products to the RV industry. There are always one or two innovative products that catch my eye. This year it was the Metal Trap Ultra Dual filtration system by Hydropure Technologies. I had the opportunity to talk to Jerry Rademan, president and scientist/chemist behind the product. Jerry has a true passion for clean drinking water and water purification. He explained to me that the Metal Trap Ultra Dual System is the only filter system commercially available that will eliminate or significantly reduce all contaminants in one single system. He said, “The people at Hydro Pure Technologies are dedicated to our families and to our customers. We think there is no other food source that impacts the health aspect of our lives as clean drinking water! It is our goal to provide the best quality water that is available commercially”. Then Jerry challenged me. He said he would send me a Metal Trap Ultra filter system and let me be the judge. What he didn’t know at the time was that we recently moved into a new house where the drinking water has an odor and taste that makes you not want to drink it straight from the tap. And if anybody would know if the filter system works it would be my wife and my 13 year-old son, who constantly talk about the quality of the water in our home. Shortly after returning from the convention I received two Metal Trap Ultra Dual water filter systems. I decided to install the larger 14,000 gallon rated system on our drinking water in the house and use the 6,000 gallon rated system for the water system on our RV. The installation was simple, especially for the RV. The installation in our house required a quick trip to Lowes for some additional plumbing fittings to tie it into the existing water system. The thing I really like about the Metal Trap Ultra Dual System is that it works for both well water and city water, so it only makes sense that it would be great for RV applications. It filters out metals like iron, manganese, and copper and it also removes hydrogen sulfide which causes the rotten egg smell found in most well-water sources. It also filters out chlorine, chlorinated organic compounds that can be carcinogenic and it removes residual pharmaceuticals, pesticides and herbicides that can find their way into our city drinking water. The metal trap Ultra dual system works on chemical oxidation, absorption and ion exchange principals that both remove and trap these metals and other unwanted contaminants. Most other filters work on physically straining the water, which doesn’t remove the contaminants that are dissolved in the water. 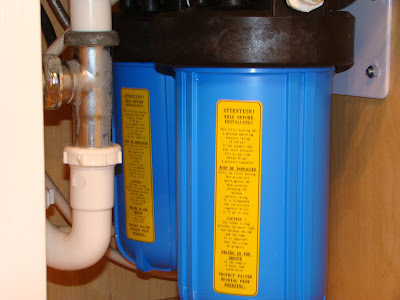 When the water enters the Metal Trap filter the unwanted contaminants get oxidized and are trapped in the filter body. The activated carbon filters out the foul tasting and potentially harmful chemicals and contaminants. When the water enters the second filter it goes through a one micron sediment filter which filters out viruses, bacteria, fine silt, oxidized metals and un-dissolved calcium particles greater than one micron in size. The real test came after the system was installed, and it passed with flying colors. No more odors and the water is great tasting too. My wife said that it lived up to Jerry’s claim that water filtered through a Metal Trap Ultra filter system is better than any bottled water and better tasting too. Why don’t you be the judge!